knee-high, and the pumpkin plants are blossoming beautifully. I’m hoping that the mysterious squash plants that sprouted after I used compost from the bin will turn out to be butternut squash. It remains a mystery however. I’m hoping for butternut squash though. I love squash and I’ve got this great new recipe that couples rooibos tea and butternut squash to make a dramatic side for any meal. I’ll get to that in a minute. First, I want to tell you about the tea you could use. Compassion Tea has just introduced 4 new rooibos teas. They’re organic and produced in South Africa using herbs and spices from that area. The Lavender Sage Rooibos takes me back to that morning about 10 years ago when I was the first one up on the boat. We were moored off a small Greek isle in the Aegean Sea and as I climbed out of the cockpit and viewed the craggy hills around me I was overcome with a sense of peace. Those hills were covered in sage and lavender and as they baked in the intense morning sun, those two scents warmed the air. It was aromatherapy in its most natural form! Add the sounds of goats and cowbells and you have created my perfect place. The Jasmine Vanilla Rooibos is sweet, breezy, and cooling… almost like a puff of air wafting through a stunning California garden full of jasmine. Very uplifting! Then there is Lemon Mint. A few years ago I came across a hand lotion that combined lemon, cucumber, and mint. I couldn’t get enough of it and started buying body wash and shampoo with the same scent. About the same time, I went to a restaurant and was served water from a pitcher full of lemon, cucumber, and mint. So refreshing! It must have been the vogue combination at the time. But, it certainly is a lasting combination. I still flavor water in this way! 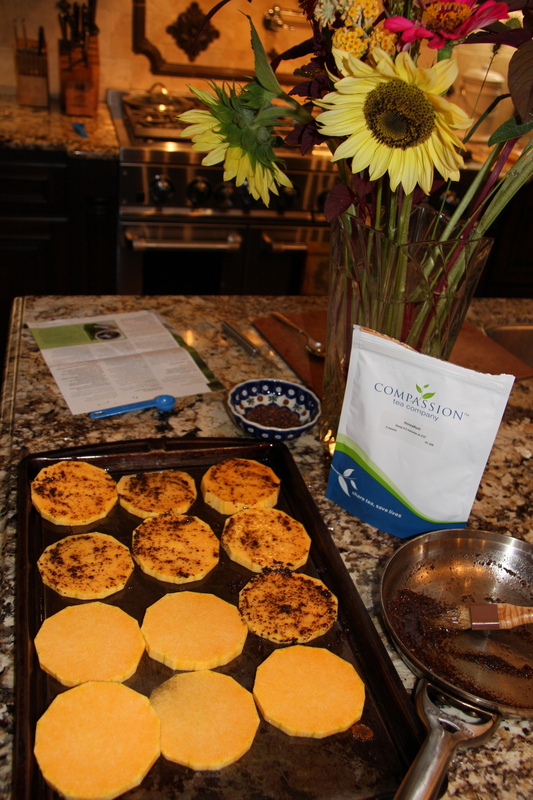 Now, Compassion Tea is introducing its version of the combination. Ice it and imagine beautiful fountains of crystal clear water dancing in your mouth! After the squash has baked for about 25 minutes, snip fresh chives over the top and enjoy! it combines chai spices, South African peri-peri chilies, and cocoa nibs with the caffeine-free rooibos leaves. Sha-zaam! The flavors burst over your tongue warm and rich. This tea has the potential to become your favorite, as it has become mine! Infuse it with butter and drizzle it over sweet potatoes or butternut squash and you’ve got flavor galore! So, back to that recipe. Here’s what you’ll need. 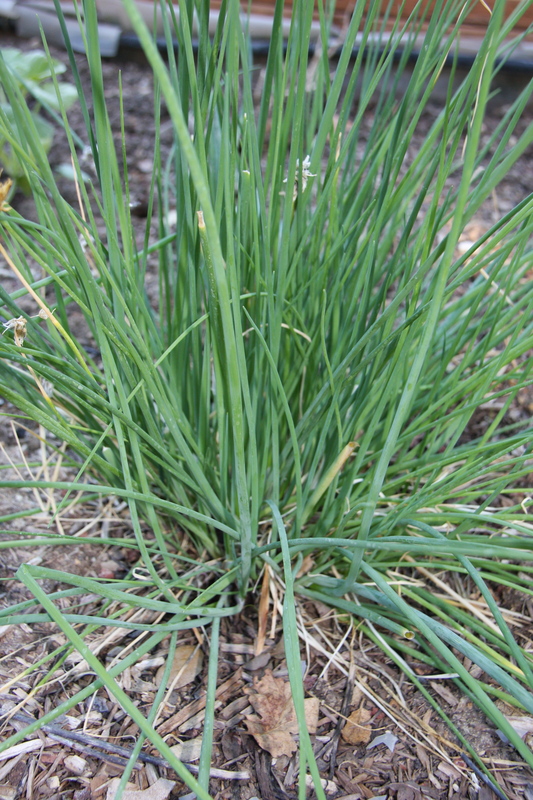 Fresh chives from the garden add the finishing touch. Preheat oven to 425 F. Melt butter in a small saucepan over medium heat and add 1 tbsp. tea. When the butter foams, remove from the heat, cover, and infuse for 10 minutes. Strain out the tea leaves from the butter through a fine sieve; discard the tea. Cut off stems and seeded part of squash. Peel the necks and then slice into ½ in. slices. 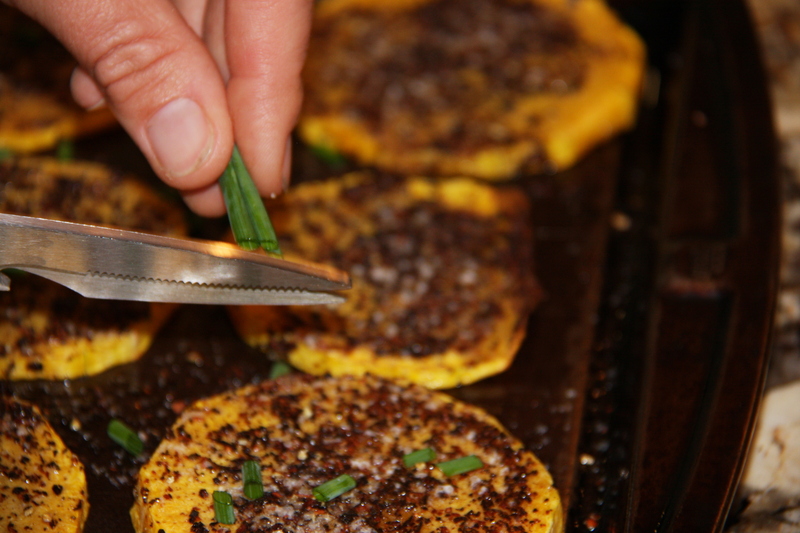 Place squash slices on lightly oiled baking sheets. Grind remaining 1 ½ tsp. tea leaves in mortar and pestle and mix with salt. Brush the squash with tea infused butter. I recommend Spicy Rooibos Compassion Tea! 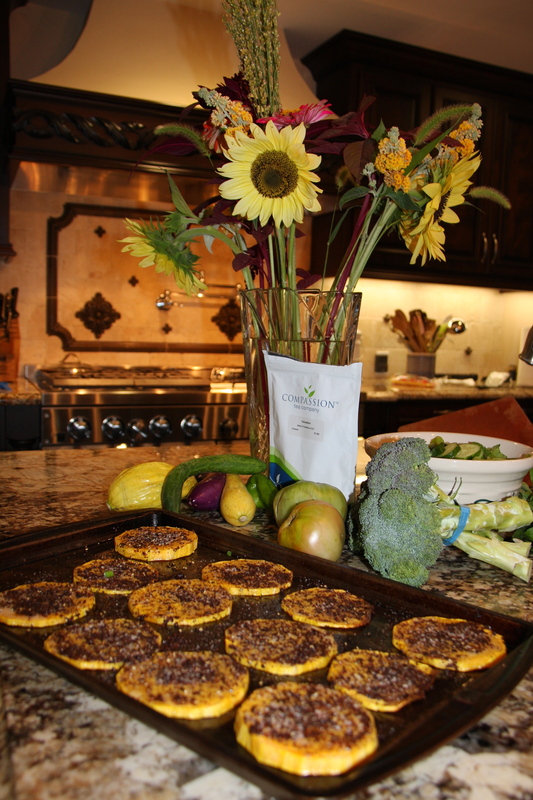 Brush butter onto tops of squash, season with pepper and rooibos salt. Bake until soft, about 25 minutes. Sprinkle with chives and tuck in! Compassion is sometimes difficult to pin down. But when it tugs on your heart like this, it is unmistakablely gut-wrenching, heart-melting, life-changing, even for a “not a cat person”! “Jack hadn’t been to Thousand Hills for six years – when it was still at an abandoned Catholic church. We found the new campus to be an oasis in the middle of exceptional poverty. It was very well kept, with gardeners and workers (volunteers from the community who work for the two meals a day offered) busy at all corners of the site. Dawn Leppan met us with warm open arms. She gave us an extensive tour through the various infant, toddler, and pre-school rooms. All of this was very clean & colorful. There were kids everywhere but no chaos. It was remarkable and encouraging. We also toured the kitchen where cheerful volunteers were preparing meals for the numerous folks waiting patiently. We also visited the well-baby clinic that was taking place that day (every Tuesday). We saw about ten pair of mothers (or grandmothers) and infants waiting to be seen and numerous others had already been seen. They have a craft store with merchandise produced by locals as well as a trauma center that Dawn’s granddaughter staffs as she is a licensed social worker on the government’s payroll. Dawn recounted some tragic stories of some of the locals who had been abused sexually and otherwise and how they’ve tried to help them recover and move forward. Dawn took us to a local community [this is the Claremont Camp I wrote about in the Olympics and the Temporary blog] where they’ve established a “safe house” and daytime crèche (daycare). The housing there was appalling with waste smell in the air and outdoor bathrooms overflowing. There were exposed live electrical wires running on the ground throughout and barefoot children nearby. We saw one encouraging house that had a small garden – modeled after the garden at the safe house. We ended this visit by touring the safe house that was part of this neighborhood. The house had the cleanliness of the Thousand Hills Clinic with about twenty kids sitting well behaved at clean, bright plastic tables. Just beyond them was a fenced in garden that would be impressive in any U.S. suburb. The contrast between the safe house / crèche and the surrounding shacks was extraordinary and a real testament to the impact that this group can have on a community. We ended our visit with the distribution of the four duffle bags we brought there. Dawn was very moved by the supplies provided; commenting regularly about how certain items would be helpful. It was very moving. Whether it be fresh, clean water or a pair of eyeglasses, we can change lives. 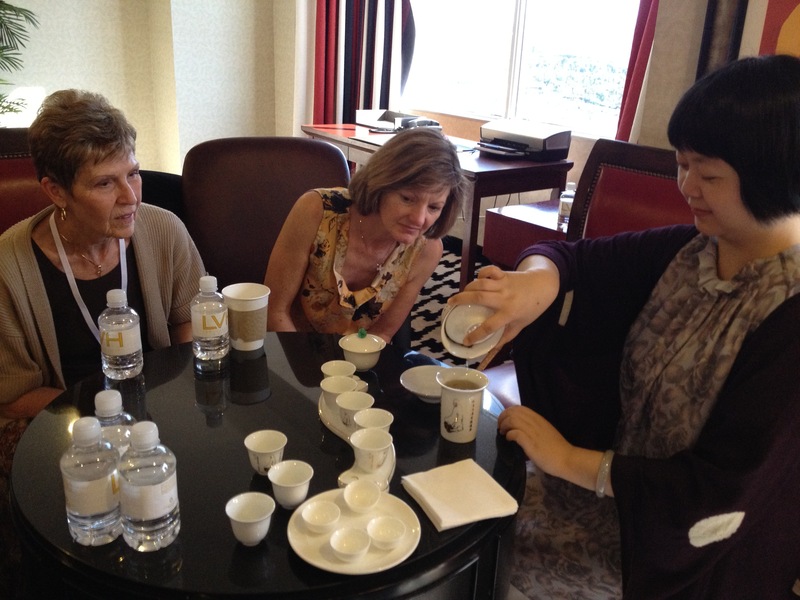 We at Compassion Tea believe that by sharing tea, we can save lives. Please join us!